How does my garden grow? In spite of me, mostly. Two months ago, the gardener finished my raised garden beds and I immediately began tossing things in: rows of seeds and plants from the nursery. My grandmother had quite the garden behind her house, which was her pride and joy; corn has never tasted quite the same since she died. I didn’t have any illusions about raising corn in my limited space – not this year anyway – but I was excited by all the possibilities. I would be overrun by zucchini! I would make fresh pesto and freeze it! A basil plant was transplanted following a week of sun, which was promptly followed by a nice chill and two weeks of rain; the basil promptly drooped over in protest. The leaves curled up and turned a bit yellow. My carrots and broccoli, they sprouted and then just sat there, steadfastly refusing to grow. My beets remained at the same height as when I transplanted them. As did the pumpkin plant. And the chard. And everything, in fact, except the spinach, which bolted. I got excited when it produced that pretty flower on the top, thinking, I’ve done it! Now I’ll have spinach! But when I looked up the next step on the internet, I discovered it was time to kiss the plant goodbye – at least, if I wanted edible spinach. I pulled it up and the roots were oddly small. The peas, however, decided to grow, and although they surprised me by being a climbing plant (who knew? ), I improved a trellis-teepee type of thing and to my amazement, they kept growing, when everything else did not. I thought maybe the problem was that I had planted too many seedlings too close together, so I pulled out a few plants, and noticed that their roots, too, were oddly small. Maybe there had not been enough sun, I thought, or perhaps I needed to fertilize more. I printed out a calendar from Seattle Tilth on the optimal times to plant things in a Seattle garden. Then I noticed that while two of my zucchini plants were fairly green and seemed to be doing pretty well, two of them were positively shrinking: Pale, yellowish leaves on plants less than half the size of their kin. I researched, and discovered there were two probable causes – overwatering, and underwatering. I live in Seattle, so the answer was clear. I stopped watering – and two days later, everything perked right up. And through it all, the peas continued their merry journey up my improvised trellis. On Sunday, it looked like I had enough peas that I could make something out of them, and though I had a dozen recipes for various pasta-with-peas recipes, I chose this one from Marcella Hazan’s Essentials of Classic Italian Cooking , because it seemed like something that peas would be a nice addition to, and I happened to have all the ingredients on hand. I modified the recipe, because it called for pureeing the shrimp, which may be good but involved more dishes than I wanted to contend with. 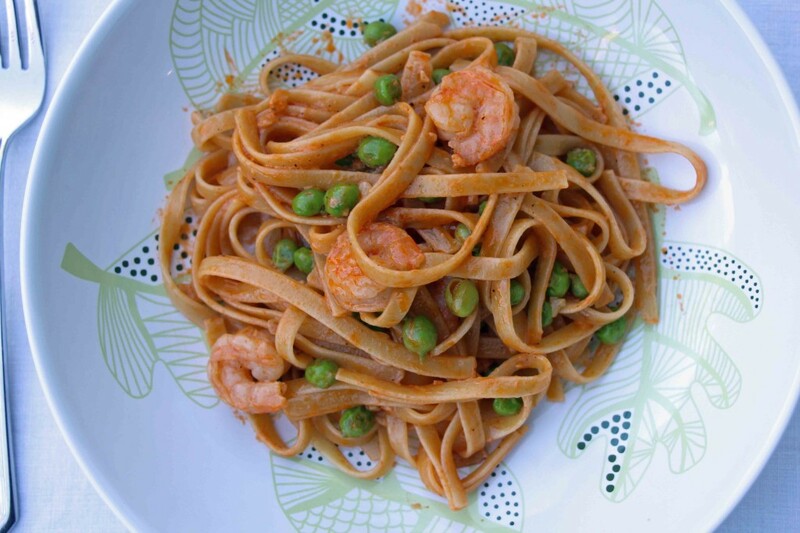 The cream sauce is lovely, lightly flavored with the wine and tomato paste, but never overpowering the shrimp and peas, which are the stars of the show. It makes an easy meal but one that could be made special with a glass of white wine on the side. I picked the peas, but The Child decided to shell them, and wouldn’t let me help even though I offered several times. Is this what you used to do at your grandmother’s house? It is, I told her. My cousin and I would go out into the garden and get the vegetables for dinner while grandma worked in the kitchen. I’d like to say I bit into those peas and they reminded me of grandma’s, but they didn’t – I doubt she ever made fettuccine or shrimp, and there was never wine in her house, ever. But like grandma, I somehow made something grow, and through my handful of peas, understood her pride. Boil salted water to cook pasta. While making the sauce, cook the fettucine until al dente, adding the peas to the boiling water a few minutes before the pasta is done. Drain. Dissolve the tomato paste in the white wine. Put the olive oil and garlic in a large pan, and turn on the heat to medium. Cook the garlic, stirring, until it is a pale gold, then add the tomato paste and wine solution. Cook for 10 minutes, stirring from time to time. Add the shrimp, salt, and pepper, and turn up the heat to medium high. Cook for two minutes or so, until shrimp are coated and cooked through (completely pink). Add the cream and cook for about a minute, stirring constantly. Toss the pasta and peas with the sauce, and serve immediately. If desired, garnish with fresh chopped parsley. The original recipe calls for pureeing ⅔ of the cooked shrimp, then adding them back to the sauce. Pureed shrimp is not my thing, so that was the major change I made to this recipe. Hazan suggests using Tortellini with fish stuffing for the pasta; if tortellini is used, the recipe serves 6.